Glass powder of Bi2O3–SiO2–B2O3 was prepared by Sol-Gel method, and the powder was heated to the temperature range from 200 to 800 °C to study the network structures formed during heat treatment. 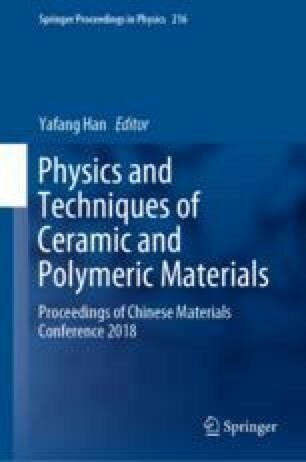 The effect of structures change of the glass powders on the transition temperature and sintering softening properties was analyzed. The results indicate that Bi3+ get into the network structure with the rising of heat treatment temperature, [BiO6] octahedral and [BiO3] triangle, [BO4] tetrahedron and [BO3] triangle connected with [SiO4] tetrahedron separately in the way of vertex connecting to build the network structures. The O1s and Bi4f binding energies increase gradually while the B1s binding energies decrease, which strengthen the stability of glass structure. This causes an increase in the transition temperature and a decrease in the wettability of the glass powder. The glass powders treated at 600 °C have excellent sintering properties. The glass transition temperature (Tg) is about 542, and the thermal expansion coefficient (25–300 °C) is close to 6.57 × 10−6/°C. This work was financially supported by Guangdong Provincial Natural Science Fund of China (Nos. 2006B14701003) and Guangzhou Science and Technology Project of China (Nos. 2015110010034).